Have school papers and kids art work already begun piling up, along with that mound near the door? Don’t be discouraged! 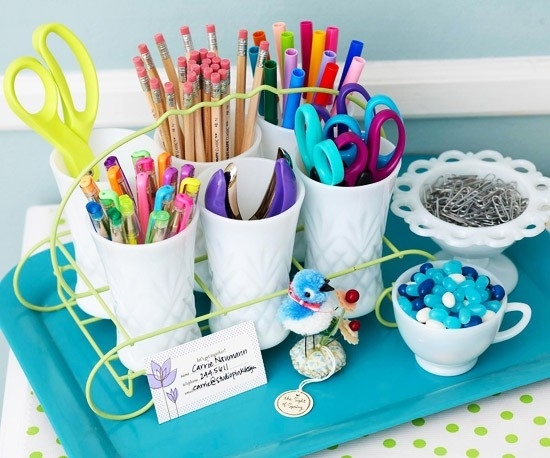 You can still get organized for the school year, even when you home school! I’m going to share with you some basic systems that everyone can use and then put their own spin on. Whether you enter through the front door or garage, it’s essential to have a place for backpacks, shoes, etc. when you enter your home. Think first of how you need to utilize this area, and then think about what items you will need to make it happen. Could you use baskets, hooks, a bench, or a shelf? Also think of what kind of family you are. Silly? How about animal head hooks? Cozy? How about an old ladder with baskets attached for hats and mittens? Don’t forget to gather or look for things in other parts of the house which can be used for this area. I recently found a coffee table that was in a corner of a toy area at a client’s home and used it for their entryway bench; the table had drawers that could be used as storage for the children’s shoes and it cost nothing. Your children will naturally gravitate toward an area they enjoy doing their homework in. This may be the kitchen table or their own rooms. Wherever it may be, be sure this space is equipped with fun storage containers filled with everything they need: pencils, calculator, paper, the list goes on! This will eliminate the aimless wandering around, while they search (and procrastinate). When homework and reading are done, have your family develop the habit of putting things into their backpacks, which should be hanging in the entryway. Art and projects can be displayed; you just need to determine how long. There are cute ways of displaying kids art, such as on a string with cute clips or a framed pin board. Once you decide on the ‘keepers’, you can store them in a decorative file folder, portfolio or art box. You could also take photos of the art pieces as you go or at the end of the year, and make a photo book or scrapbook out of them, then toss the originals. I’m visual, so for me, I would have a board (magnet, pin) to use for school notices and activity scheduled. I would add a calendar (paper, chalk, white board) for all the dates and events. Some boards will come with a combination dry erase calendar and cork board. If you prefer everything tucked away, you can use file folders, labeled, in a portable filing box. You could even attach a calendar to the front of the box. What is the best place or way to put daily assignments for each child? Where should I store books and folders for each child? We lived in New England, so we have used cranberry crates, you can also find wooden crates at antique stores. Where to put supplies, including art supplies? Look to places like Ikea, Michaels and Target for fun storage ideas and easy access. Time for your fun and functional home and school year! Anita Sisler is the owner of The Declutterbug. Helping people declutter and organize their homes, while building relationships are one of Anita’s passions. She loves to encourage people to think past the traditional and make their spaces uniquely their own filled with things that make them smile and bring peace into the chaos. Having been a homeschool mom for twenty years I have learned the art of making spaces what they need to be with whatever I have to work with. Find out more at Thedeclutterbug.biz, or give Anita a call at 339-832-1220.